Scientists from the University of Sheffield have identified factors which are driving the evolution of herbicide resistance in crops - something which could also have an impact on medicine as well as agriculture. Xenobiotic chemicals, such as herbicides, fungicides, insecticides and antibiotics, are used in both agriculture and healthcare to manage pests and diseases. However, resistance has evolved to all these types of xenobiotics, rendering them ineffective with serious consequences for crop production and health. The new study, led by researchers from the University of Sheffield's Department of Animal and Plant Sciences in collaboration with Rothamsted Research and the Institute of Zoology, Zoological Society of London, gives an important insight into how we can learn from past management of agricultural systems to reduce the likelihood of resistance evolving in the future. Current strategies for managing resistance revolve around diversifying management and the range of chemicals used. Similar techniques have been proposed in medicine and agriculture but there is not yet a consensus on what is the best approach. 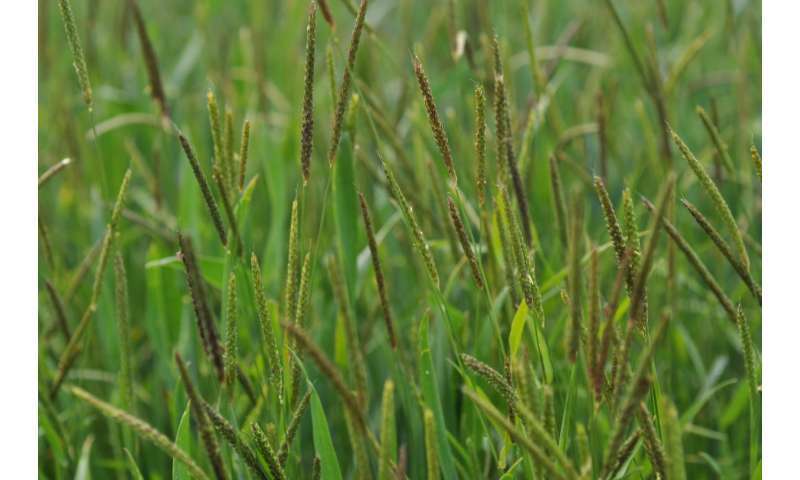 In the new study, published in Nature Ecology and Evolution, researchers examined the evolution of herbicide resistance in black-grass (Alopecurus myosuroides) in the UK. This has become a widespread weed present in 88 per cent of 24,824 of quadrats - small areas of habitat selected at random as samples for assessing the local distribution of plants and animals - monitored by researchers. It has spread northward in recent years and the scientists found the weed in areas where it had not been found in previous decades. Lead author of the study Rob Freckleton, Professor of Population Biology from the University of Sheffield, said: "The driver for this spread is evolved herbicide resistance: we found that weeds in fields with higher densities are more resistant to herbicides. "Once resistance has evolved it does not seem to go away: two years later, fields with high densities still had high densities, despite farmers employing a suite of different management techniques. "We estimate that the economic costs of this are very high: the costs of weed management have doubled as a consequence of evolved resistance." The research offer important insights into diversifying management which is suggested as a possible technique for reducing the evolution of resistance. The study showed the technique will work to reduce resistance only if farmers reduce their inputs of herbicides. If they continue to use the same levels of herbicides or even increase their input, then this technique will not work. The new findings show the volume and diversity of herbicide products are positively related to each other. Professor Freckleton said: "The results were simple: farms that used a greater volume of herbicide had more resistance. "Beyond this we found little evidence for a role of any other management techniques: neither the diversity of chemicals used - for example whether farmers used a variety of herbicides or just one - or diversity of cropping mattered, despite both being advocated as methods to reduce the evolution of resistance." He added: "New techniques such as precision agriculture (PA) offer the possibility of targeted applications of chemicals: for example, robots could give doses of herbicide at the level of individual plants. "In the meantime, the results that we have obtained suggest a simple rule of thumb: just using more herbicide will select for more resistance." The study showed that even in the absence of chemicals, directional selection from the repeated use of the same management will lead to evolution resistance. This highlighted a need to design a management system in which evolution is anticipated. Apart from focussing on densities and yields, there needs to be an appreciation of resistance. "In an example of convergent evolution, one ecotype of the weed barnyardgrass (Eichochloa crus-galli var oryzicola L.) appears indistinguishable from domesticated rice (Oryza sativa L.)," said Professor Freckleton. "Barnyardgrass is a weed because it reduces the yields of rice, so when farmers see weeds they pull them out. This behaviour has been selected for weeds that mimic the crop, as weed plants that look similar to rice avoid being killed. "This is evolved resistance: when we manage natural systems in a selective manner, evolution is inevitable."